1. 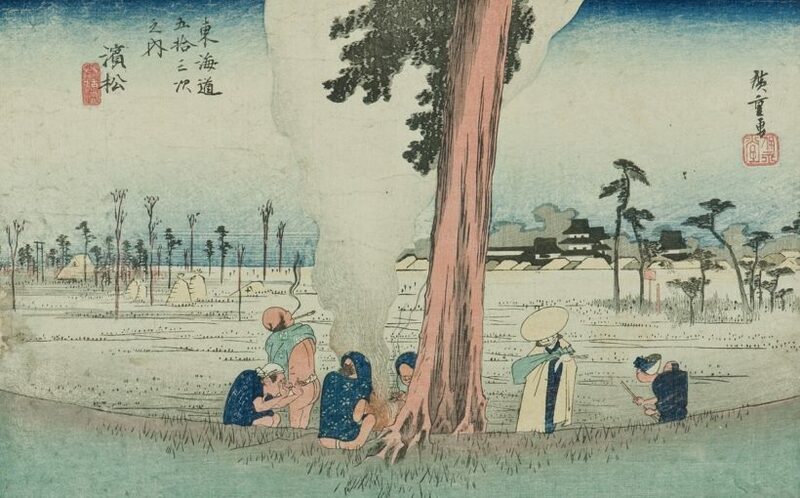 The art of woodblock printing became widespread in Japan during the Edo period (1603-1868) and is best known in the genre of ukiyo-e prints of the period. Prior to this, woodblock printing in Japan was used almost exclusively for reproducing Buddhist texts. 2. The ukiyo-e prints were a significant artistic development starting around the late 17th century. 3. Meaning “pictures of the floating world”, ukiyo-e depicted domestic scenes, historical events, well-known scenic spots, scenes from Kabuki theatre and the geisha of the pleasure quarters. In short, they represented the hedonism enjoyed by the merchant class at the bottom of the social hierarchy of Japan during a period of prosperity. 4. The technique of Japanese woodblock printing consists of relief-carving on wood and colour application, not unlike Western woodcut processes. 5. As these images were mass-produced through woodblock prints, they were modestly priced, and therefore, widely available and distributed. 6. Ukiyo-e prints began in monochrome in the 1670s, then hand-painted colours were added for special commission. By the mid-18th century, multiple woodblocks were used to produce areas of colours, so that full-colour prints soon became the standard. 7. The 19th century produced two of the best-known ukiyo-e masters: Katsushika Hokusai (1760-1849), who is famed for Great Wave off Kanagawa, probably the best known Japanese work of art; and Utagawa Hiroshige, also known as Ando Hiroshige (1797-1858), who is known for his landscape format series “The Fifty-Three Stations of the Tokaido”, and the vertical format “One Hundred Famous Views of Edo”. 8. Ukiyo-e prints also found popularity in Europe during the 19th century, playing an important role in the art trend known as “japonisme” and inspiring many famous artists including Vincent Van Gogh and Henri de Toulouse-Lautrec. 9. During the early 20th century, the ukiyo-e print movement was revived as shin-hanga (“new prints”), with a large audience and patronage also from the Western world. 10. Shin-hanga prints followed in the tradition of ukiyo-e prints in subject-matter – landscapes, kabuki theatre scenes, beautiful women – but had the added layer of optical perspective, mood and lighting, influences from photography.